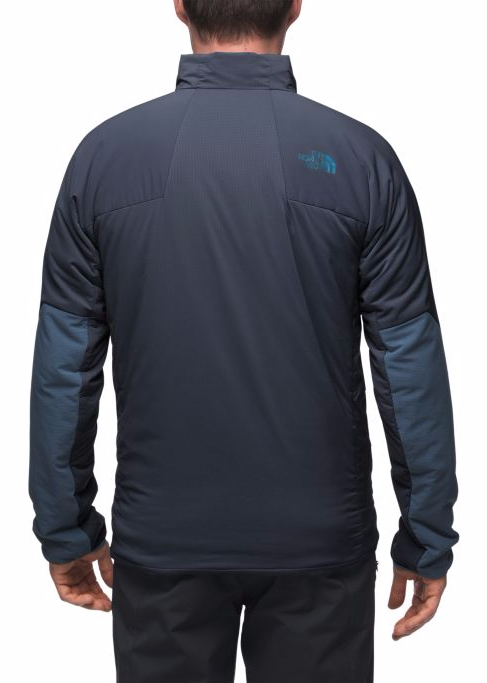 Basic summary: The debut vehicle for The North Face’s new Ventrix material, which provides dynamic insulation that increases ventilation when you’re active, and retains heat when you’re going slower. You’re going to hear a lot about Ventrix from The North Face in the year ahead; the innovative material will be featured in several performance-oriented outerwear garments designed for aerobic activity in cold conditions. The technology debuts this fall in the men’s and women’s Ventrix jacket and hoodie. We’ve tested the jacket version through a recent stretch of mornings in the mid-20-degree range, and it performed quite well at keeping us warm without excessively overheating, wearing just a short sleeve base layer underneath. In plain terms, Ventrix is a synthetic insulation material with laser-cut perforations that can expand and release heat or contract and retain heat, all based on the intensity of your movement. During times of sustained activity, the perforations open wider to allow heat and perspiration to escape, but when activity is minimal, the perforations close down to provide greater insulation. Thermoregulation is further enhanced by positioning the perforations in key zones that tend to see increased perspiration, such as the rear torso and underarm areas. Thanks to its dynamic nature, the Ventrix material isn’t especially bulky in relation the amount of insulation it provides. It also has a small degree of stretch capacity – as do the exterior fabrics – so freedom of movement isn’t compromised even with a slim fit profile in the torso. If you want full weather resistance, it would be easy to layer a waterproof shell over the Ventrix jacket, but you then lose the “magic” of the Ventrix material in action. Fortunately, the exterior shell construction is protective enough to wear the Ventrix in just about all manner of winter conditions. The main panels have nylon ripstop with 30D resistance for air directed toward the body; and they are especially protective at the forearms – a common area where runners get chilled – where 50D ripstop is used (higher Denier = thicker fabric fibers = more air resistance). The entire exterior surface has durable water repellent to shed mild to moderate precipitation, and the Ventrix material maintains its insulative capacity even if it gets soaked. 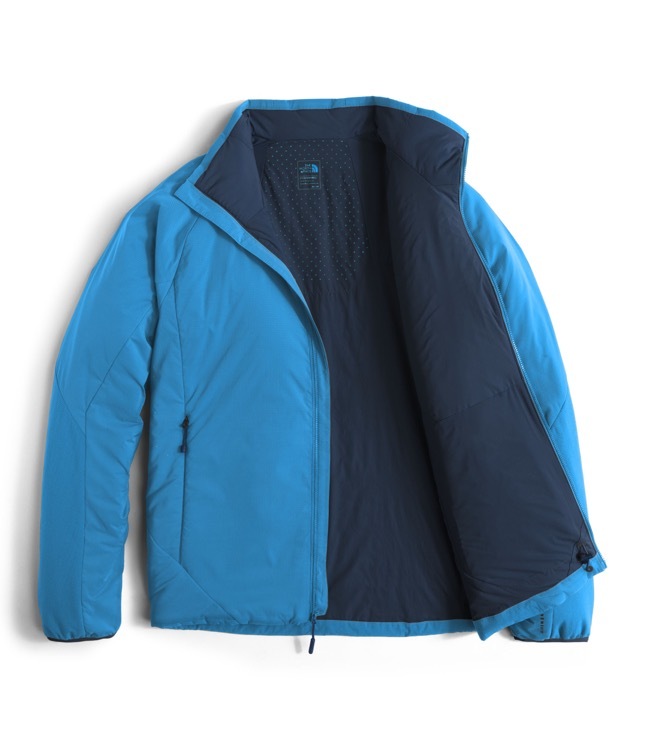 Fabric construction of the shell also contributes to the dynamic ventilation capacity of the jacket; alignment of the fibers results in increased permeability for air moving away from the body than it has for air moving toward the body. This is noted on the spec sheet as “30D x 20D,” for example: air directed toward the skin meets 30D resistance, while air leaving only has 20D resistance. We found the Ventrix to be an overall very comfortable jacket, for its soft exterior surface and smooth interior feel, for a comfortable neck line and general ease of movement with high intensity activity and more casual outings like hiking. Dual hand zipper pockets have the same smooth interior lining as the inside of the jacket, and elastic cuffs rest easily at the wrists. 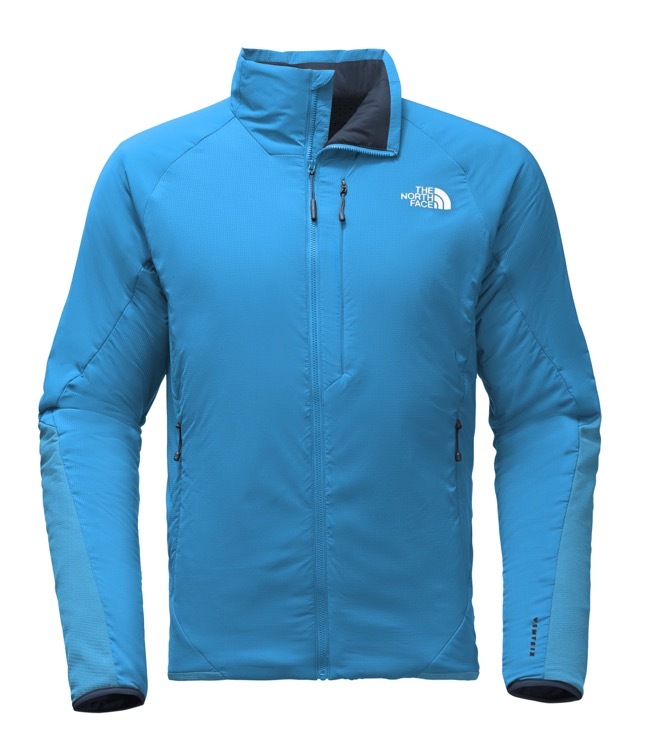 The jacket doesn’t have thumbholes if that’s your preference, but that’s really the only small drawback in what is otherwise a very well-crafted jacket for long cold trail outings. 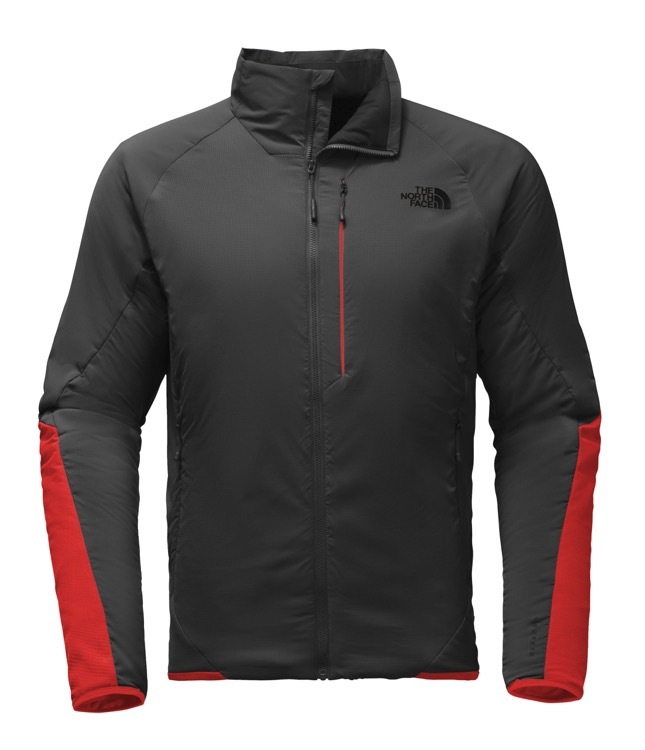 The North Face Ventrix Jacket and Ventrix Hoodie are available in full size ranges and multiple color options for both men and women at www.thenorthface.com.